Habitat III, which took place in October 2016, represented a great opportunity for APA and its membership to contribute ideas, best practices, and concerns to the agenda and to the goals for planning's contributions to the future of our communities. In San Francisco, APA expects to host a large contingent of planners from around the world. The 2019 National Planning Conference affords a chance for the members of the Global Planners Network (GPN) to get together face to face for a meeting. On the agenda are each members’ updates, other conferences, and topics including building planning capacity worldwide. Since World Urban Forum 3 at Vancouver in 2006, APA and our partners in the Global Planners Network have added content and a voice for planning to these important biennial events. Kuala Lumpur, Malaysia, is hosting the 9th version of the Forum, February 7–13, 2018, with more than 20,000 attendees from all around the globe. The focus of this WUF is the implementation of the New Urban Agenda, adopted by all the countries of the world in Quito, Ecuador in 2016. Among the examples of implementation in the U.S. are Baltimore and New York, which are already incorporating the Urban and Community Goal and indicators and these cities were highlighted at the New York NPC session on this topic. Members of Global Planners Network in attendance include APA, the Canadian Institute of Planners, the Royal Town Planning Institute, Commonwealth Association of Planners, Planning Institute of Australia, the International Society of City and Regional Planners, the International Federation of Housing and Planning, the New Zealand Institute of Planners, and Renaissance Urban of France. At World Urban Forum 9, from left, Eleanor Mohammed, president of the Canadian Institute of Planners (CIP); Dy Currie, president of the Commonwealth Association of Planners (CAP); John Acres, president of the Royal Town Planning Institute (RTPI); and Ric Stevens, vice chair of APA's International Division and president of ISOCARP. Global Planners Network was successful in submitting a networking session on the topic of Good Governance and Good Planning, offering insights into the key role of planning in good governance. The Quito Implementation Plan for the New Urban Agenda (NUA) states three priorities that lead to sustainable urbanization: a supportive governance structure, 21st century urban planning, and establishing sound financing mechanisms. This networking session demonstrated specific ways planning increases transparency; improves government integration; and creates a platform for public, private, and NGO collaboration. Often the barrier to healthy and inclusive communities is social and political. Engaging citizens and stakeholders in the planning process ties good governance to the outcomes of planning and the NUA. GPN members highlighted the important linkage among statutes, incentives, and government structure in making planning work for everyone. Case examples from Brisbane, Australia, to Beaumont, Canada, gave the audience a great cross section of practical ideas to better serve our communities. In addition, GPN members participated in over a dozen other sessions as panelists presenting on topics such as community engagement, TOD, density bonuses, cultural heritage conservation, cultural mapping, and green space networks. GPN also was part of the launch of Planners for Climate Action, coming together as a new cooperative initiative under the UN Framework Convention on Climate Change (UNFCCC) and its Marrakesh Partnership for Global Climate Action. The new initiative was publicly launched on Human Settlements Day (November 11, 2017) at the 23rd Conference of Parties (COP-23) to the UNFCCC in Bonn, and the group met and hosted several session at WUF9. We also engaged with ICOMOS in promoting the value of cultural heritage as a framework for more livable cities. A session highlighting the importance of cultural heritage in planning was held in cooperation with a local Malaysian partner, Think City. Ege Yildirim, the ICOMOS Focal Point on the Sustainable Development Goals joined many of the GPN meetings and events. Please contact Jeff Soule at jsoule@planning.org for more information. The World Urban Campaign brings together a variety of interests, disciplines, and geographies to support the efforts of UN Habitat to improve the quality of urbanization globally. This report focuses on APA and APA partners’ activities to promote planning in shaping and responding to urbanization at all levels. The World Urban Campaign is led by Rose Molokoane and Sandeep Chakra along with a steering committee made up of member organizations. The importance of planning is emphasized in Sustainable Development Goal 11 and is also among the goals in the New Urban Agenda, adopted at Habitat III. Awareness of the value of planning has grown over the period since the adoption of the SDGs in late 2015. This is evidenced by increased participation of urban planning experts in meetings and in the incorporation of language that reflects goals and objectives reinforcing APA policies and objectives in urbanization. In terms of partnerships, one example is the concept note we prepared with the International Council on Monuments and Sites (ICOMOS) that has achieved wide recognition and continues to inform, influence, and expand awareness. At recent high level meetings in New York on the future of urbanization within the United Nations, representatives from member states reflected the increased influence of planning in their comments. The APA Board of Directors is pursuing a thorough review of APA's International Program to develop alignment with our development plan and activities and our participation in the World Urban Campaign and related programs. One of the major breakthroughs in the New Urban Agenda and subsequent conversations is a recognition of the key importance of local government. United Nations members are nation states, so this recognition is not without debate or difficulty. Governance models around the world vary widely and many do not accord much independence to local government in terms of power and finance. This issue is one of the defining elements of the future of urbanization: whether governance can adapt and reinforce the value of decentralization of managing urban areas and providing local financial tools to implement that management. This issue will shape how well policies and practice can support human-scaled, culturally and historically informed development of cities. The most recent activities involved the High Level Meeting on the Future of UN Habitat in New York, noted earlier. Genie Birch, FAICP, former chair of the World Urban Campaign and now co-chair of the General Assembly of Partners, spoke at this event emphasizing governance and its fundamental connection to planning and urbanization as well as the role of civil society in advising and implementing the New Urban Agenda. A meeting of several allies after the UN session compared and refined joint efforts. A meeting with Ege Yildirim and Andrew Potts in Washington, D.C., reinforced this collaborative agenda and laid out a variety of upcoming efforts. Coming in October is the UN Habitat and World Urban Campaign Meeting in Dubai. APA is sponsoring a session on the SDGs in cooperation with APA's International Division at the ISOCARP Conference in Portland, Oregon, held jointly with APA's Oregon Chapter. APA will also participate in the World Design Summit in Montreal. These and other events lead up to the next World Urban Forum February 7–13, 2018, in Kuala Lumpur. APA will be submitting session proposals and continuing to collaborate with the partners assembled for the effort at Habitat III to maintain and strengthen partnerships and outreach. At each of these events and in private meetings with allies and influencers, APA emphasizes the value of planning as a fundamental requirement for sustainable urbanization. Please contact APA Director of Outreach Jeff Soule at jsoule@planning.org to provide your ideas and information relating to our objectives and efforts to promote planning within the World Urban Campaign. APA will participate in the Urban Thinkers Campus hosted by the Nebraska-based Joslyn Institute for Sustainable Communities this August. The program highlights the role of small and medium-sized cities in global sustainability with a particular focus on the relationship between cities and their local universities. Learn more about the program at www.joslynutc.org/utc2.html. Urban Thinkers Campuses are a program of the World Urban Campaign and this is the second such program held by Joslyn. GPN also discussed partnerships and participation in upcoming international planning events, including the joint APA Oregon Chapter and International Society of City and Regional Planning (ISOCARP) conference slated for late October. This will be the first time ISOCARP has partnered with an APA component for its international meeting. Tracks include: technology, infrastructure and buildings, governance and inclusive communities, culture, community experience and the sharing economy, resilience, adaptation and disaster mitigation, technology and small communities, and post-smart communities — new frontiers. Two sessions on important international planning initiatives were well attended in New York. One focused on the big picture: What are the goals? How is APA participating in the implementation and development of planning strategies? The second showed how New York, Baltimore, and San Francisco are incorporating the SDGs and NUA into their local plans and implementation actions. If you or your city are working with these guidelines, please share your efforts so APA can introduce your work to APA members and our international colleagues. Case examples provide valuable lessons. In spite of the recent announcement to withdraw from the Paris Climate Accord, APA continues to provide support for planners. In addition, the cities above have each joined other American cities to continue participation in the effort despite the lack of support at the national level. Former NYC Mayor Michael Bloomberg also announced that he will personally provide millions of dollars to maintain America’s involvement in meeting the accord’s goals. One is related to three U.S. cities — Baltimore, New York, and San Jose, California — that are integrating the SDG metrics and indicators into their plans: "Implementing the UN’s Global Agenda for Cities" on Sunday, May 7, 1 p.m.–2:15 p.m. The second is "Implementing the UN's Sustainable Development Goals" on Saturday, May 6, 1 p.m.–2:15 p.m. This will be a broader look at the goals themselves and the metrics recommended to track progress. Together, these two sessions will give a good understanding of the goals and recommended indicators, and how to adapt them to the local level. Global consulting firm ARCADIS published a very detailed and data-driven analysis of the world's cities in terms of sustainability last fall. While not one U.S. city cracked the top 25 (New York was ranked 26th), other Global Planners Network members boast cities which ranked in the top. There are things cities as diverse as Zurich, Singapore, London, Hong Kong, and Sydney can share with all our members. Baltimore, New York, and other cities are already incorporating the Urban and Community Goal and indicators. Here is the complete text of the goals, targets, and indicators. If you are already working with them and incorporating them locally, please feel free to share your progress with us. Email Jeff Soule, FAICP, at jsoule@planning.org. The Global Planners Network has a recently updated website that can serve as another resource for those members and allies interested in international issues. Each of the GPN members is engaging its own members in an effort to both share the results of Habitat III and find ways to inform local plans with those goals. In New York at the 2017 National Planning Conference, there will be two sessions on Habitat III: one related to three U.S. cities — Baltimore, New York, and San Jose — which are integrating the SDG metrics and indicators into their plans: Implementing the U.N.'s Global Agenda for Cities along with Implementing the Sustainable Development Goals, which will be a broader look at the goals themselves and the metrics recommended to track progress. Together, these two sessions will give members a good understanding of the goals, recommended indicators and how to adapt them to the local level. Upcoming in early February is a working group meeting on the implementation of the Sustainable Development Goals, hosted by the Turkish government, which is chairing the working group. The meeting will focus on SDG 11, the Urban Goal. Among other items to be developed in detail is the role of cultural heritage as it relates to sustainability. If members have examples of ways they are incorporating these goals and indicators in their own planning — public, private and NGO — please share them with Jeff Soule, FAICP, at jsoule@planning.org. We have many outlets to showcase what's going on in the U.S. that can inform other planners' effort as well as sharing the great work going on globally. Global consulting firm ARCADIS published a very detailed and data-driven analysis of the worlds cities in terms of sustainability last fall — and not one U.S. city cracked the top 25. (New York was ranked 26th.) Obviously there are things cities as diverse as Zürich, Singapore, London, Hong Kong, and Sydney can share with our members. Habitat III is now history. The main outcome was the adoption of the New Urban Agenda by acclamation. Two years of hard work and discussion led to 193 countries reaching consensus on a recommended path forward for global urbanization — no small achievement. APA and its allies were among the many private organizations reviewing and recommending the final language. Among the most important aspects are citizen participation, planning and development based on sound metrics, and transparency in governance. While there is nothing binding about the agreement, national governments supported it and more than 1,500 non-governmental organizations offered unprecedented participation and concrete contributions. This suggests the agreement will be an important tool as cities grow and develop. APA organized a Global Planners Network (GPN) panel that featured APA President Carol Rhea, FAICP, and Tim Van Epp, AICP, chair of APA's International Division, speaking on public participation. The capacity audience — over 125 people — heard general ideas as well as specific cases from the speakers. 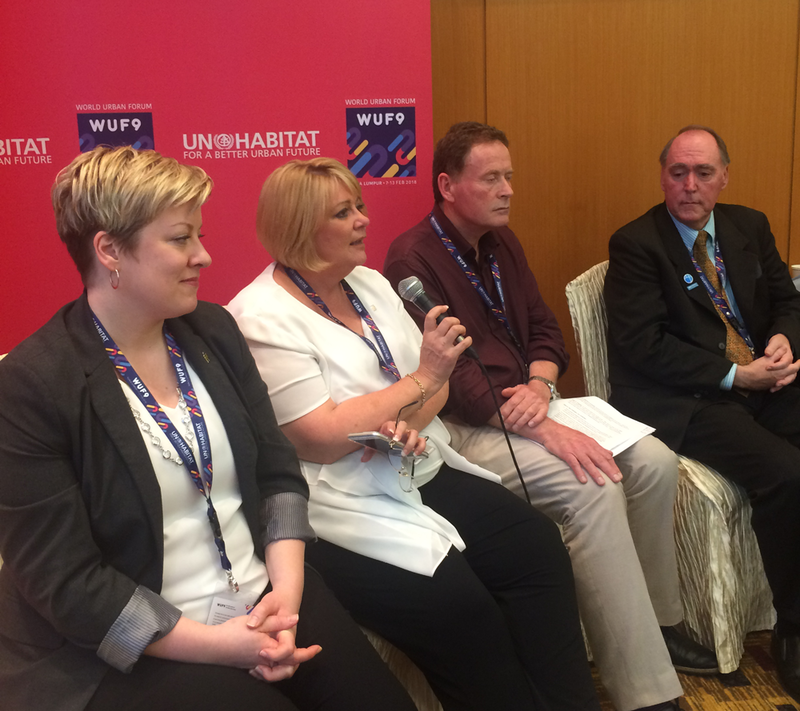 GPN and our allies presented over 35 sessions at Habitat III. GPN exhibit space was shared with a broad effective coalition including domestic allies, the American Society of Landscape Architects (ASLA) and the American Institute of Architects (AIA) along with international partners the International Federation of Housing and Planning (IFHP), the International Council on Monuments and Sites (ICOMOS), the Grand Circle Alliance, Paris, and the International Society of City and Regional Planners (ISOCARP). Each organization took turns staffing the booth and answering many questions. Traffic was varied but steady and at times very busy. One of the highlights of the week was the Viva Alameda Urban Village project with ICOMOS after six months of planning and preparation with the local and international teams. The historic neighborhood is adjacent to the World Heritage central city. During the months leading up to Habitat III, the community identified issues and priorities with help from both international experts and city agencies. All this culminated in a local charrette on the final day with more than 150 community residents participating. After the charrette, the city and the international organizers agreed to continue to support the neighborhood and implement several recommendations. Viva Alameda charrette break out group discussing urban patterns. Photo by Jeff Soule, FAICP. Over the next several months, APA and its International Division will work with our allies on guidelines for implementation. Many of the New Urban Agenda recommendations are found in various PAS reports and policy guides already. There are many examples, policies and planning cases from other countries that can inform our domestic practice, just as we share our best practices abroad. The first post-Habitat meeting on the action plan will be held in New York in mid-January 2017. 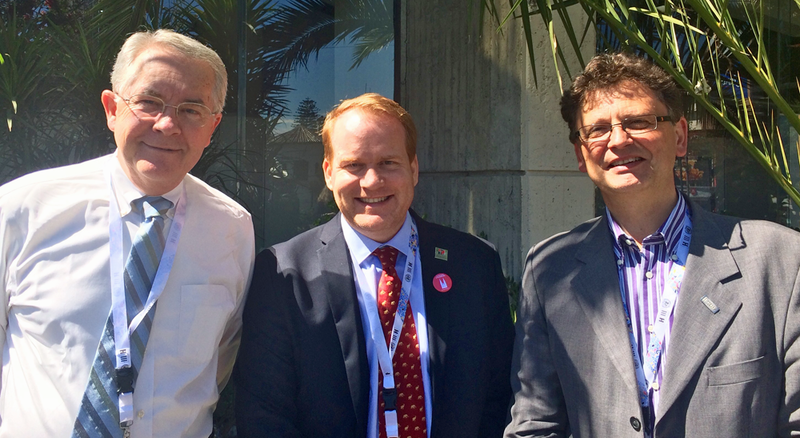 APA International Division Chair Tim Van Epp, AICP (left) — here with GPN member Nicholas Buchoud (center) and newly elected HPF Chair Didier Vancutsem of ISOCARP — joined the Habitat Professionals Forum meeting. Photo by Jeff Soule, FAICP. APA will continue to develop resources for APA members to use the outcomes of Habitat III in their own localities. Habitat III, the United Nations Conference on Housing and Sustainable Urban Development, is taking place in Quito, Ecuador, on October 17-20, 2016. The United Nations has called the conference, the third in a series that began in 1976, to reinvigorate the global political commitment to the sustainable development of towns, cities and other human settlements, both rural and urban. The conference offers a chance for the international community at all levels to harmonize its understanding of the problems and opportunities posed by current trends in urbanization. This includes poverty, quality of life, environmental degradation, climate change, and other concerns on the one hand, as well as the economic, social, and creative boons provided by cities on the other. At the table will be nearly 200 national governments that make up the UN General Assembly with support from cities, the private sector, and civil society. The focus of Habitat III is for the nations of the world to adopt the New Urban Agenda. That agenda will set a new global strategy around urbanization for the next two decades. 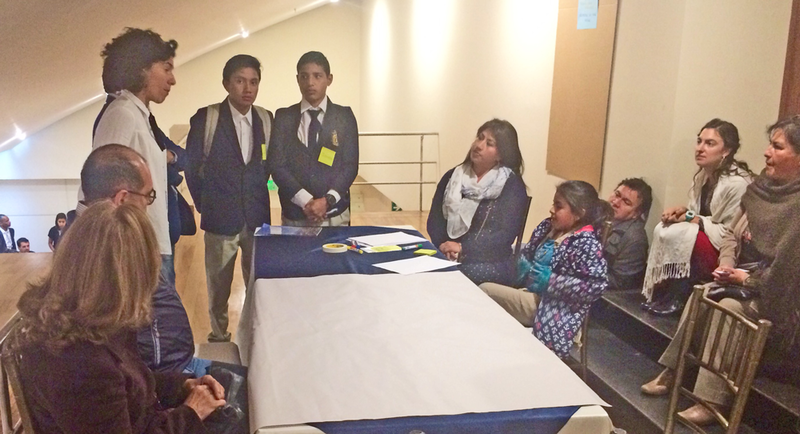 The most recent draft of the NUA for adoption in Quito is now available. APA is participating in Habitat III in collaboration with the Global Planners Network, the American Institute of Architects and the American Society of Landscape Architects, all of which will be sharing space under the banner of the GPN in the Habitat III Exhibition October 15-20, 2016 (Area F, Booth #155). In addition, APA President Carol Rhea, FAICP, will share practical tools and techniques for engaging the public in planning during the GPN Side Event, "Planning for Public Engagement," on Monday, October 17, alongside representatives of the Canadian Institute of Planners, Planning Institute of Australia, and the Royal Town Planning Institute. Historical center of old town Quito in northern Ecuador in the Andes mountains. Quito is the second highest capital city in the world. Thinkstock photo. APA is also co-sponsoring a local intervention project with the International Council on Monuments and Sites (ICOMOS) as part of Habitat III's Urban Village the entire week of October 17. The project, titled "Quito's Historic Barrio La Alameda: Forging Heritage Tools for Urban Sustainability," invites participants to literally and digitally stroll the byways of Quito's historic Barrio La Alameda neighborhood for an authentic introduction to the neighborhood's rich mix of historic buildings, green public spaces, and cultural traditions. The project will culminate in a live charrette on Saturday, where international visitors, local experts, and neighborhood stakeholders will work together to answer questions about how heritage elements can contribute to a sustainable vision of the future. The official APA delegation to Habitat III includes President Carol Rhea, FAICP; Chief Executive Officer Jim Drinan, JD; International Division Chair Tim Van Epp, AICP; and International Outreach Director Jeff Soule, FAICP. Other APA members attending Habitat III include: Ric Stephens; Bruce Stiftel, FAICP; Greg Scruggs, AICP; Jennifer Senick; Scott Edmondson, AICP; APA International Division Officer Victoria Okoye; Isabel Barriga; Paul Farmer, FAICP; Patricia O'Donnell; APA Student Representatives Council Representative George Benson; and Justin Moore, AICP, APA lead on the Belize Community Planning Assistance Team. The latest draft of the New Urban Agenda is out and comments are welcome. Thanks to the members who already provided input through the previous drafts! The main activity of PreCom 3 will be to finalize the draft ahead of the Habitat III meetings in Quito in October. APA will collaborate on an Urban Village workshop with one of the local neighborhoods in Quito throughout the event as well hosting a side event, and partnering with many others on their side events. Under the banner of the Global Planners Network, we will share an exhibition space throughout the week. APA is joined by RTPI, CIP, PIA, AIA, ASLA, ISOCARP and ICOMOS in putting the exhibition space together. APA is also co-sponsoring a Side Event with the International Council on Monuments and Sites (ICOMOS) entitled Governance and Planning: the Role of Cultural Heritage. Member states, civil society, and other key stakeholders continue to prepare for Habitat III where the next global commitment setting the agenda on cities for the next two decades will be signed in Quito. The Zero Draft of the New Urban Agenda was released in early May. On May 16 and 17, 2016, local authorities from across the globe participated in intersessional meetings, where they represented their cities and spoke directly with national governments — and expressed dissatisfaction with their status as mere "observers" of the multilateral process. Read what they had to say in response to the draft document. The City We Need document highlighted in the last update expresses the need for local and regional governments to take an active role in the implementation of the New Urban Agenda. As planners, we know the importance of local government in planning and development. On June 6 and 7, 2016, stakeholders (including civil society, the private sector, academia, and grassroots organizations) had the opportunity to speak directly to the member states and respond to the Zero Draft. APA is a member of the General Assembly of Partners (GAP), chaired by Eugenie Birch, FAICP. The general public also has the opportunity to share ideas and comments on the Zero Draft through the Online Dialogues, open until July 8, 2016. The next key meeting will be PrepComm3, taking place in Surabaya, Indonesia, at the end of July. APA is joining ICOMOS, the Regent of Geinyar Bali, Indonesia and the City of Zanzibar for a Side Event on Governance, Planning and Culture and will participate in the drafting sessions of the New Urban Agenda. Over the last several months, there have been 26 Urban Thinkers Campuses around the world including one in Omaha where APA's Jeff Soule, FAICP, presented the APA Sustaining Places Guidelines as a means to help implement the Sustainable Development Goals adopted last fall. On 22 December 2015 the United Nations General Assembly, on its 70th session, adopted the resolution on the "Implementation of the outcome of the United Nations Conference on Human Settlements (Habitat II) and strengthening of the United Nations HumanSettlements Programme (UNHabitat)" (A/70/473), which refers to the United Nations Conference on Housing and Sustainable Urban Development - Habitat III Conference's modalities. The approved rules of procedure for Habitat III recognize the participation of the representatives of local authorities accredited to the conference. As an accredited party to the UN, APA has been active in promoting our Sustaining Places effort along with our Policy Guides in the drafting of the World Urban Campaign's "The City We Need." In early March, after hearing from over 7,000 individuals and hundreds of organizations, the World Urban Campaign released the final draft of "The City We Need." Also in early March, at the World Urban Campaign Steering Committee meeting, the section on Urban Solutions will be discussed and finalized. Following this meeting, we will post the outcomes and more information about the events and activities leading up to Habitat III. At the upcoming National Planning Conference, APA leadership will discuss our plan to participate in Habitat III, including information for members who plan to attend, session proposals, exhibit space and programming with our partners, and our position and policies as the relate to the outcomes of the conference. APA's efforts continue to be supported and bolstered by our International Division, chaired by Tim Van Epp. On September 25, 2015, the U.N. General Assembly ratified 17 global goals to guide development during the next 15 years. APA offers planners some talking points to help them discuss the goals with their colleagues and communities. APA is a member of the National Report subcommittee and HUD, as chair, is encouraging our input and suggestions of examples of programs, initiatives, policies, and approaches to include or highlight in the U.S. National Report covering our efforts in Urban issues over the past two decades. We know that all of you, either directly through your own work or through the work of your colleagues, are aware of numerous outstanding programs and initiatives. Of course we will not be able to list every single effort in the U.S.; we will be looking to represent the range and diversity of approaches across the U.S. Therefore, mention of programs, links to examples and analyses will be very helpful to us as we explain the story of housing and urban development in the U.S. to domestic and international audiences. The template to provide information to inform the National Report can be found here. From September 27–29, 2015, in New York City, global leaders will convene to adopt the Sustainable Development Goals that will become the suggested policy on urbanization and development for the next 15 years. To read more about the Summit and the expected outcomes visit www.un.org/sustainabledevelopment/summit/. APA has been a contributor to the discussions on the SDGs and more importantly, the indicators that can be incorporated into planning efforts and plans that will be needed to implement the goals. Those metrics and indicators are still being discussed and we welcome your ideas and input. Urbanization: In the last two decades, we have experienced and observed unprecedented and incessant urbanization. Asia alone is expected to add 800 million urban residents in the next 15 years. Rapid growth and globalized development have transformed cities especially in many countries of Asia, Africa, and Latin America while urban areas in Western Europe, North America, and Australia have in many instances seen a decline in population and economic activities or significant social changes due to global migration. These have posed persistent threats to the heritage assets and values and the identity of historic places. Urbanization in many emerging economies has been rapid, incessant, excessive, and often uncontrolled. Rampant growth of cities has resulted in deteriorating urban environments, inadequate water supply and sanitation, a vast increase in poverty and those living in slums without access to many of the social amenities and infrastructure of the city. Such modes of urbanization have also been destructive to local ecologies, natural resources including land and water bodies, and cultural resources including built heritage, building crafts, traditional knowledge and creative industries. Globalization and Loss of Identity: The globalization processes have resulted in increasing homogenization and standardization across the world. This in turn has led to a growing search for identity. Places are the spaces of identity; the memory of the urban system; the stable element in its dynamic change. Places assume a key role in the urbanization processes as they satisfy the need for identity. Cultural heritage plays a key role in the establishing the identity of places and their regeneration. Tourism: Global tourism to heritage sites and cities, at times excessive and insensitive, has exacerbated the conflicts between global cultures and local beliefs and practices around cultural heritage. The flow of capital, the demands of tourists for familiar modern amenities, and the environmental externalities of tourism have distorted the value of heritage and destroyed the fragile systems that nurtured it. Tourism can introduce or accelerate social change and revive folk arts but also exacerbate commodification. In some historic places, the pressure to preserve heritage of a particular period for the benefit of tourists has stymied inclusive and sustainable development for local communities and marginalized their needs. Large-scale development, real-estate interests and tourism have often led to a superficial and decorative view of culture that threatens to erode the fragile and intangible heritage of local communities. Disasters: In the face of increasing risks of disasters, including climate change related disasters, planning for sustainable development has become all the more urgent. The Sendai Framework for Disaster Risk Reduction 2015-2030 was adopted at the Third UN World Conference in Sendai, Japan, on March 18, 2015. It is the outcome of stakeholder consultations initiated in March 2012 and inter-governmental negotiations from July 2014 to March 2015, supported by the United Nations Office for Disaster Risk Reduction at the request of the UN General Assembly. The Sendai Framework is the first major agreement of the Post-2015 development agenda, with seven targets and four priorities for action. The ICOMOS Committee on Risk Preparedness (ICORP), along with ICCROM and the World Heritage Center, worked closely to see that cultural heritage considerations — both ways to reduce the risk to heritage from natural disasters but also how heritage, including the embedded environmental knowledge in cultural heritage, is a source of disaster risk reduction and increasing the resilience of local communities. As a result, the Sendai Framework represents a successful model within the Post-2015 agenda for addressing culture and heritage that must be closely linked to Habitat III, the SDGs and COP21. The Sendai Framework on Disaster Risk Reduction may be found at www.preventionweb.net/files/43291_sendaiframeworkfordrren.pdf. Heritage and Local Communities: In some, histories of conflict and disasters have resulted in significant demographic changes with migrant and refugee populations in and around iconic heritage properties with no particular connection to them. In others disappearing and devalued traditional livelihoods and intangible heritage have resulted in heritage properties as empty shells filled with shops for tourists or as slums. These instances have pointed repeatedly to the need to connect and integrate tangible and intangible heritage in and around valuable cultural heritage including the traditional materials and techniques for building as well as the intangible practices that make the place meaningful. Inadequate Urban Planning: Urban planning can be a tool for making the city more inclusive, resilient, safe and sustainable. Planning can also serve as a tool to valorize places to transforming them into catalysts for regeneration of the urban area and the city as laboratories of creativity. Regeneration of cultural landscapes is the starting point for the regeneration of cities in many historic urban areas. Haphazard urban development and inadequate planning is a major challenge to such cultural landscape regeneration. Click here to read the full Concept Note. The American Planning Association continues to play an active role in the global policy space and the United Nations agenda. Through our participation in the Campaign for an Urban Sustainable Development Goal (SDG), APA continues to assist in the creation of United Nations and Habitat agendas. Additionally APA continues to participate in preparations for other international development efforts like COP21, this year's Climate-focused summit held in Paris this December, as well as an Urban SDG pilot-project applying sustainable development goals to five cities across the globe in an effort to analyze the effectiveness of such implementation measures. APA's participation in this working group also relates to cutting edge financing structures for international sustainable development, as well as a whole host of fall forums hosted domestically in the United States aimed to assist The Road to Habitat III. Now is the time for us to contribute to the global conversation and the New Urban Agenda. Help the American Planning Association add to the discussion. The United Nations Human Settlements Programme (HABITAT) will be hosting its first Global Summit in over 20 years, next October in Quito, Ecuador. The American Planning Association as part of our International Outreach and Education efforts will be participating as one of the lead American ambassadors for this event, hosting workshops, engagement activities, and practitioner idea-exchanges throughout the event. UN Habitat has now opened up its comment period for you to add your voice! Referred to as Urban Dialogues, comments are being solicited by the UN from now until July 31, 2015. They are seeking new ideas, knowledge sharing, experiences and perspectives, from Planners and urban practitioners just like you, all in an effort to provide emerging ideas aimed at reframing urban issues worldwide. Browse the six categories and comment on issues that you are most passionate about — issues such as: Spatial Development, or Urban Ecology and the Environment. Answer questions about urban equity such as "What can cities do to promote social cohesion and inclusion." Visit www.habitat3.org to add your comment and provide beneficial insights to real-world issues and challenges. The New Urban Agenda is framed as a convening of minds seeking to provide solutions to the complexity of urbanization in the modern world. At current estimates, four out of every five people will be living in towns and cities by the middle of this century. In this context the agenda speaks to the dynamic and symbiotic linkages between urbanization and development, and the necessity to manage this relationship by way of sustainable growth. Habitat III will engage United Nations Member States, multilateral organizations, local governments, the private sector as well as civil society, all of whom will play a role in our collective sustainable future. The precursor to this global forum, Habitat II, was hosted by the UN Human Settlements Program in 1996 in Istanbul, Turkey. Twenty years have passed since the world has contributed to such a dialogue. As new challenges emerge and rates of urbanization expand like never before, Habitat III provides a rare opportunity to chart a new course for human settlements and development policy across the globe. The American Planning Association continues to play an active role in the global policy space and the United Nations agenda. Through our participation in the Campaign for an Urban Sustainable Development Goal (SDG), APA continues to assist in the creation of United Nations and Habitat agendas. Additionally APA continues to participate in preparations for other international development efforts like COP21, this year's climate-focused summit held in Paris this December, as well as an Urban SDG pilot-project applying sustainable development goals to five cities across the globe in an effort to analyze the effectiveness of such implementation measures. APA's participation in this working group also relates to cutting edge financing structures for international sustainable development, as well as a whole host of Fall forums hosted domestically in the United States aimed to assist, The Road to Habitat III. There are two subcommittees of the national committee planning for Habitat III in Quito, in October 2016, in which APA is participating: Connecting the United States to Global Conversations and the National Report. We welcome contributions from APA members and partners on both topics. Communitas, a coalition of global organizations has prepared a good summary in its FAQ about Habitat III, which may be reviewed at www.communitascoalition.org/pdf/Communitas_FAQ_Habitat3.pdf. The Global Conversations subcommittee is co-chaired by Blair Ruble at the Woodrow Wilson Institute and our own very active Genie Birch, FAICP. In the first meeting of the subcommittee last week we discussed a way to engage all of the organizations involved to share events, activities, case studies and research. We want to bring ideas and activities globally to U.S. communities and also share what we are doing and learning here so it's a two-way street. The National Report will be an update on activities and lessons learned relating to the state of cities and towns as well as national policies since the last Habitat in 1996 in Istanbul. The agenda that will frame the National Report will start with the Habitat II Agenda at http://ww2.unhabitat.org/declarations/ist-dec.htm. We envision the activity to result in an actual report, but we also believe that we can use this opportunity to establish a broader platform for ongoing discussion, sharing activities and research and best practices. We will be working on the tools for sharing among our own members and partners and the myriad communications devices to help engage a broad audience including elected officials, private sector and civil society organizations. The second meeting of the national committee which will offer more information is March 11. I will share the update with you in my next update. As an active member of the World Urban Campaign steering committee, we will be participating in the next meeting of the committee in Nairobi, April 11-12, 2015, and the following Preparatory Committee of the United Nations for Habitat III, April 12-16, 2015. Among the items for discussion is refining and editing The City We Need document, which may be found at http://unhabitat.org/the-future-we-want-the-city-we-need/. I continue to work closely with APA's International Division and hope that you will let me know your questions and ideas as we continue toward Habitat III. 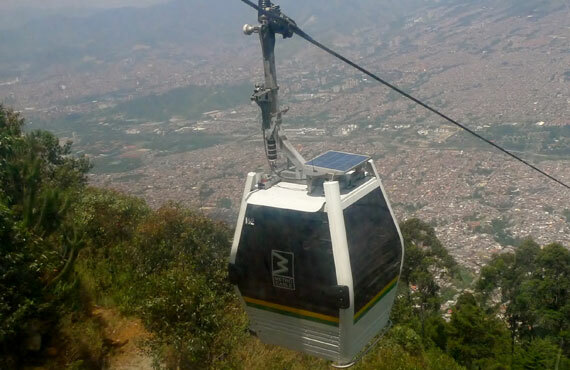 abitat III will be held in Quito, Ecuador, in October 2016. APA is participating in the lead up through the World Urban Campaign (WUC), a broad group of private nonprofit organizations. WUC will continue to refine this initiative by joining the Habitat General Assembly in Nairobi, Kenya, April 13, 2015. For members interested in contributing local stories relating to the Sustainable Development Goals and Habitat III, contact Citiscope, edited by Neal Peirce, at http://citiscope.org/editorial-opportunities/write. At the 17th Triennial General Assembly of the International Council on Monuments and Sites (ICOMOS) November 2014 in Florence, Italy, APA collaborated on passing a resolution to support and to refine the Urban Goal. The resolution noted that the conservation and enrichment of cultural heritage and traditional settlement patterns represent a major contribution to sustainable development. In December, the Secretary General's synthesis report, "The Road to Dignity by 2030: Ending Poverty, Transforming All Lives and Protecting the Planet," recommended the retention of the 17 goals — including the first-ever urban sustainability Goal 11 to "Make cities and human settlements inclusive, safe, resilient and sustainable." APA is planning a webinar in March, co-sponsored with APA's International Division and featuring APA Pennsylvania Chapter member Ron Bednar talking about his work with the United Nations Association and ways in which other chapters could partner with the association's locations around the country. Genie Birch, FAICP, chair of WUC, attended the first of several meetings in New York January 19-21, 2015, to finalize the Sustainable Development Goals. In March, the UN will take up the details of establishing metrics to use in the monitoring and review of indicators for the Sustainable Development Goals. HUD has convened a national committee to coordinate U.S. government participation in cooperation with NGOs like APA. Subcommittees have just been established — APA is on the Connecting to the Global Urban Agenda. I will report ways that you can review and contribute to the partnership once we have our first meeting in February. APA Director of International Programs Jeff Soule, FAICP, attended the first preparatory meeting leading up to Habitat III in 2016 September 15-18 at the United Nations. He reports that the stand-alone goal on sustainable urbanization is in the draft set of priorities that is moving forward. APA joined other NGOs in June 2014, supporting the inclusion of this stand-alone sustainable urbanization goal in a letter to the U.S. ambassador to the United Nations, drafted by Eugenie Birch, FAICP, chair of the World Urban Campaign. The World Urban Campaign steering committee meeting was joined by Dr. Juan Clos, director of UN Habitat and the lead person in charge of preparing for Habitat III. Clos challenged the group to be more explicit and focused on the issues of urbanization and not to try to put every problem in the world into making better places. He said simply that we have seen rapid global urbanization in the last 25 years, but it isn't sustainable. We need to make it clear that there are best practices that can make better cities, more human cities and more sustainable cities. Habitat III will be guided by the principles found in The City We Need. That each partner organization draft detailed positions on how to achieve The City We Need objectives. That each organization drafts a roadmap of activities and input leading up to Habitat III. APA's proposal to have an Urban Lab at the meeting was accepted so our visibility in the program is enhanced. The program identifies the Historic Urban Landscape approach as an important planning process that integrates new development in local context. In addition, it provides a focus on the role of planning in addressing the issues we face in 21st century urbanization. APA participated in UNESCO's drafting process of the HUL and several National Planning Conference Sessions have featured the process and case studies. The most recent blog on the use of this methodology is called "Historic Rural Villages in Yunnan." Read the final text of "Recommendation on the Historic Urban Landscape," adopted in 2011. View the program for the strategic planning session, Urban Thinkers Campus: The City We Need. If you have thoughts or materials that you feel would contribute to the overall advance of cities and towns worldwide, please e-mail Jeff Soule at jsoule@planning.org. APA's International Division is also a great way to stay engaged in this and other issues.